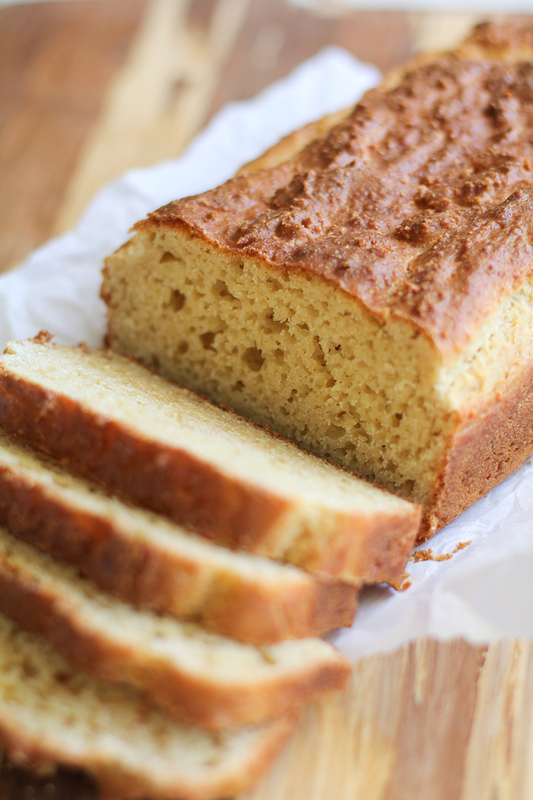 Grain-free sandwich bread made with almond flour and tapioca flour – it’s the best thing since sliced bread! Add the yeast, coconut sugar, and warm water to a large mixing bowl and stir well. Allow mixture to sit 5 minutes to activate the yeast. Whisk the egg, olive oil, and cider vinegar into the yeast mixture. In a separate bowl, stir together the almond flour, tapioca flour and sea salt. Pour this dry mixture into the mixing bowl with the wet mixture and stir vigorously for 30 seconds. Cover bowl with a towel and put in a warm place (next to a window in the sunshine works great). Allow dough to sit 60 to 90 minutes (mine took 60), until it has doubled in size and is full of air bubbles. NOTE: the dough will be very sticky and wet - this is normal. Preheat the oven to 350°F and lightly oil (or spray) a 9x5-inch loaf pan. Once the oven has finished preheating, pour the dough mixture into the loaf pan. Note: leaving the dough in the loaf pan while the oven is preheating may cause bread to sink in the middle slightly, so wait until the oven is all the way hot before transferring the dough to the oiled loaf pan. Bake in the oven for 45 to 55 minutes, or until bread is firm, golden-brown, and cooked through. Allow bread to cool in the loaf pan for at least 30 minutes before running a knife along the edges, turning it out onto a cutting board, and slicing it with a serrated knife. Use for toast and/or your favorite sandwiches! The bread dough should be very thick. If it's overly dry, you can add a couple tablespoons of water to get it to the consistency you see in the photos. Note that if you bake at sea level, you may need to adjust the liquid amount and the bake time. I bake at 6,000 feet of elevation. I’ve been trying to make gf bread that tastes good and has a nice texture. This is it. Easy and tasty. I don’t even miss regular bread with this! I have been using this recipe for about 2 years. I have made some modifications that make it even more successful. 1. I use 1 cup water 2. 1-2 tsp xanthan gum. I have also made the recipe halfing the almond flour to 1 1/4 cup & 1/3 cup coconut flour. Adding 2 eggs & 1-2 tsp xanthan gum. I also started using 3 1/2 tsp yeast & it raises perfect! The consistency is not as thick as original recipe but is a little thicker than a quick bread batter. I use a spatula dipped in water to get out of mixer & to smooth batter in loaf. These recipes take much longer baking time. I bake at 375 in gas oven for 60 minutes. I bake in a glass loaf pan with parchment paper liner & it comes out beautiful. I also cover the loaf with aluminium foil tent over & remove for last 10 minutes. Both my versions turn out a softer final product & doesn’t crumble, perfect for sandwiches. I slice & put in ziplock bag & refrigerate & it is good for at least a week. I just mixed this bread andit was very thick. You say to get it the consistancy as shown in the photos but all I see are finished loves of bread. Please help. Really outstanding recipe! We’ve been searching for & tasting Paleo bread recipes, and this one has the best texture, flavor, and crust! As soon as our first loaf came out of the oven, we sampled it, made toast, and devoured half the loaf! Thanks! There are almost 3,000 calories in this bread recipe. I know we don’t count calories when eating paleo, but in this case I think it is necessary. I have not made this bread yet but intend to make it in the morning. If I can get 15 slices from the loaf( and that’s a big if) that is still 200 calories per slice. I am anxious to try it and see how it turns out and how it tastes. I have made many paleo loaves over the past 2 years and have not been happy with most. What size pan did you use? Someone said they made it in their bread machine, what weight did you use 1, 1.5, or 2.0 lbs? The recipe was baked in a 9×5-inch loaf pan. You could use a 1 1/2 lb. bread machine for the recipe. Be sure to use the gluten free setting. Can I adapt this to instant yeast and, if so, how? Thanks. Yes, you can substitute instant yeast 1:1 for active dry yeast. Just keep an eye on the dough, as it may rise faster. I have been really diasppointed in the paleo breads I’ve tried, but this is delicious. Yum. Can a different sweetener be used like monkfruit sweetener? Yes, but note that yeast will not metabolize monkfruit sweetener. You may use it to sweeten your recipe. Did this in my bread maker today and it turned out fantastic ? Thanks so much for this incredible recipe . A huge hit with my family . I was wondering if it was possible to use this recipe as a base to make cinnamon raisin bread ? Thoughts ideas ? I’m so happy to hear that you loved the bread. You can definitely experiment with adding different mix-ins or flavors. Let us know how it turns out! I made this today and the dough was very dry and thick, like sugar cookie dough. It didn’t rise and the result was very dense bread that wouldn’t cook all the way through. I double checked all the measurements and I did everything right. Any ideas? It’s possible too much flour was added. It can be tricky when using cups to measure flour, as the amount can vary greatly depending on how you added the flour to the measuring cup (scoop & sweep, using a spoon to add the flour to the cup, etc…). If your dough seems dry when mixing or kneading, it’s ok to add in more liquid, 1 tablespoon at a time, until you achieve the desired consistency. Also, flour absorption can vary from brand to brand as well as lot to lot, so just keep an eye on how your dough is feeling during mixing/kneading and adjust as needed. Let us know if you try the recipe again. Can you make this bread for a bread machine? If it has a gluten free setting, you should be able to make this recipe in a bread machine. Let us know how it turns out! The flavor of this bread is very good. I let the bread rise just a bit after putting it in the loaf pan. It was still very solid and not as airy as the picture showed, however, I think that my oven may be hot. The crust was quite hard and difficult to cut through. I will try 325 degrees and see if that helps. My husband loves it as toast!